Well, you might be thinking after reading through the first 4 posts: 'You haven't mentioned instances or bosses, how will that work in this game?' Well, it'd be different from most MMO's. The idea is to keep server populations rather small so that instancing is not required. What there would be is persistent boss lairs that require teams to group up and go take them down. What this allows is for giant guilds to attempt the boss with more people than normally would be required if they under gear the content or want to get it down quickly. Especially on PvP servers, what makes this viable is that if you die, you drop half your gear. Even on PvE servers anyone can pick this up, so there could even be thieves on PvE servers who follow raids around and are scavengers of corpses. -Instead of a few specific instanced areas, there would be massive underground dungeons, island dungeons, volcanic and cavern dungeons and outside dungeons. These would all be persistent areas in which the content would respawn at specific intervals. So for a large outdoor end game boss, the respawn rate might be a day, or a few days, or a week for really powerful bosses. The goal is to keep servers relatively small to say WoW or other MMOs, and make epic boss fights that are a risk to engage. A wipe to your raid would mean thousands of gold worth of items strewn across the battlefield for looters to come and get. Guilds might even try to have a few people stand aside in case of a wipe and collect all the items they can from the corpses. The idea is to make it risky. MMOs these days have no risk. Just reward. Sure, players would complain about it, there are lots of complainers, but it adds to the intensity of playing the game. You would feel actual nervousness or excitement when facing a boss that has the ability to wipe out your hard earned gear. But at the same time the reward for killing the boss would be worth the risk. There would have to be a balance between risk and reward to make the game intense. These would events would add an element of defense to the cities and towns around the world. Players out on missions across the oceans would have to come back home and help defend if it was left unguarded. - End game would basically consist of epic world bosses. Massive dragon lairs with a giant dragon boss, giant enemy NPC fortresses with massive warlord bosses, islands inhabited by only super strong monsters and endless tunnels in a mountain governed by giant rock monsters are just some of the dungeons I can imagine being in the game. Players would gather up with their guilds and charge out to fight these epic battles and come back with riches should they succeed. All in all, I think that while some of my ideas may not work or be very fun by themselves, if you put them all together you make a meaningful game that is different from anything out there. These are not all original ideas, not much is nowadays, but I took what I think were great ideas from many different games, along with some of my own versions of these things and put them in these posts for you to read. And let's hear some feedback! What do you think about these posts will not work? What do you like? What concerns do you have about server stability, amount of content, production cost for something of this magnitude? This series is meant to invoke thought about what could be done today in an MMO differently, and bring a conglomeration of good, but non-mainstream ideas into one ideal game. Thank you for reading my post series and please feel free to contact me, post on reddit, this blog or e-mail me at WakeskaterStudio@gmail.com. If you are aligned to good, you keep a third/half your items/armor when you die and receive no penalty for killing players aligned to evil and flagged as a PKer. Most players who don't go around killing newbs will be aligned to good. Players who align themselves either good or evil are only able to enter towns of that alignment. Perhaps there could be neutral players who can enter both, but as players flagged themselves as PKers they would have to flee the main cities and congregate elsewhere and build their own city. When they got to a field, instead of a servant of Zoan, a servant of Daemonica would let you buy land/get quests/build your city, etc. In these PvP realms, there would be a less emphasis on demon invasions (which I'll detail in post 5) and more of an emphasis on "evil players" vs "good players". Structure and "Laws" would have to form in these 'Evil' towns in order to ensure that PKer players don't just kill other PKers cause they can. Community and a form of order would have to evolve in order for the Evil towns to not get decimated by the Good ones. Well, that's my post on PvP for My Ideal MMO. Stay tuned for the last post about end game content and how that fits into this world that we've been creating so far. For my ideal MMO, a wild rat monster wouldn't drop you a cloth armor. For one, that makes no effing sense. And for two, by removing armor drops from monsters, bosses, demons, etc., you make crafting very, very important. And you can make it fun too! What I will do is go through the crafting segments and what they do, and then talk a little bit about how you use crafting, the importance of crafting to this fictional game, and how it would involve the player in something more than just click to make 100 boots! The other part about crafting is making each and every crafting skill a mini-game. Now the idea here is to make it worthwhile to craft and more fun. This changes it from people who just buy massive amounts of material and max crafting to a system where people who invest the effort will see the results of their work. They will have to work at making quality items, and by making skill based mini games, you can have an item have a quality reflective of the players ability to craft well. One thing I would like to see as well is the ability to purchase land from a set out area and own personal property. This could be achieved by setting out large plots of land throughout the world that are able to eventually be settled. The first players would be able to buy land from the Servant of Zoan and start making the first town. As more players buy land in an area, special quests would show up at the servant to begin making other NPC buildings in the town such as: A blacksmith, a forge, a bank, walls, etc etc. These quests would be to collect massive amounts of resources and special items to improve the town. Also as the town grows, you would be able to have guards, and other NPCs defend the town with the players. Well, this is one of my favorite topics: Crafting and Player Owned Land. And I think games just try to fit the mold too much to do some of these things. But I would love to see them in some of the MMOs that will come out in the future. Hope you enjoyed this (pretty long) post about crafting, questing and player owned housing in my Ideal MMO. 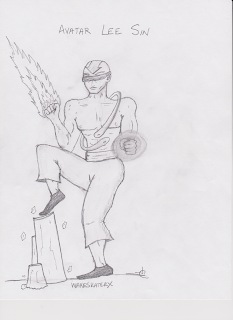 This is a rough sketch but I finally got my scanner working and here is my concept art for a skin someone suggested on the forums: Avatar Lee Sin. 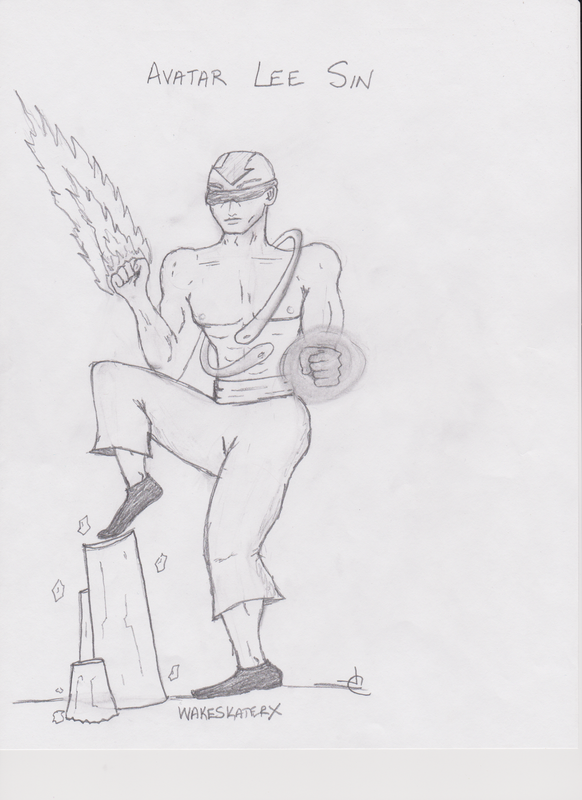 Note that this is also a rough draft sketch, done in about ten minutes on my break at work. Hope you like it and I'll be posting it on the LoL forums as well. I am working on the content for the next major post in my 5 part series on: My Ideal MMO, so expect that to come soon when I get a good day off. Runescape, believe it or not, has pretty much what I would like to see in an MMO. A true combat oriented MMO mind you. What I have in mind is a system where ANY type of character you want, you can make. Want a swordsman that uses elemental magic? Level up magic and sword arts. Want a plate wearing healer? Level up heavy armor and restoration magic. Want a fist fighting necromancer? Level up Bare handed fighting and necromancy. Sure it would lead to overpowered combinations, but that's why you'd make counter classes, and of course scaling levels (which I'll explain in a bit). Crafting would use a similar skill system, but we'll wait to go into that and focus on the combat skills. So for combat skills, I figured three main categories would work: Physical, Magical, and Armor. - Cloth Armor: Cloth armor would include all soft type armors. As you level armor skills, you both increase the effectiveness of armor in battle as well as allowing you to equip higher levels of that type of armor. Higher levels of armor skills would also give you bonuses for wearing all cloth armor and sets of cloth armor. Cloth armor in the game would generally have magic enhancing stats and low armor values giving the player better magical aptitude but not much physical defense. Armor skills would be leveled by taking damage while wearing that armor. Each time you gain a level of any profession, the experience for the next level of any profession would increase. So if it takes 100 experience to get your very first level in swords, it would take say 110 experience to get your next level in heavy armor. This would increase dramatically as you gain many levels making it very difficult to level up more than 3-4 professions at once. This would be balanced to keep players from swapping their professions around and leveling all of them together. Your meta level would be much higher for one, and you wouldn't have the high skills or items that you can get with those skills that others of the same meta level would have. This keeps players focused on a few skills that they want. Think of Skyrim in this regard. You can't level everything at once, you are forced to make decisions. Well that about sums up combat, leveling and the skills. If you have any questions or ideas, flaws in my ideas or suggestions please e-mail me at WakeskaterStudio@gmail.com or simply reply to this blog. These are all my rough ideas and it just feels good to get them down. I will probably come back and edit the blogs later and revise my ideas, but for now this is just throwing out there what I would like to see. Next, probably tomorrow or sometime this week, I'll release my views on crafting and the item system in the game as well as talking about player owned property and how questing would work. So, I have had in my head for a few years what my perfect, ideal MMORPG would be, because nothing out there has really drawn me in. Rift is good, I used to be a WoW junkie (Vanilla -> Cata), SW:ToR was good for a while, but nothing so far has really got me involved. Everything is too damn standard. What I want breaks pretty much all the rules of game design, and I want to at least post my idea since I don't really have the resources to design something of this magnitude. And yes, I tend to think big. So I'm going to be going through a series of posts detailing each of the areas in the game and the way I would like to see a game some day apply them. I will treat this as a pseudo game design document, explaining each area of the game and how it would be set up and why. In this first post I will lay out the idea for the world, the story behind why the player is there, the starting area for the player and the graphical theme of the game. In the second post I will go over skills and leveling which will lead into the third post about crafting, questing and player owned land after that. Next I'll discuss PvP and then finally end game content and how it will fit into the game, since this is an idea for a non traditional MMO. The first is a massive continent with various land formations and all sorts of terrain. In the first idea for the world, there would be expansive valleys and wide forests leading into mountains, deserts, tundras, beaches and whatever else you can think of. There would be one main continent with possibly other continents in later expansions. The second idea is a water filled world with many island chains, with large continents as well (not AS large as the first), but much more of a sea based adventure. Think LoZ: The Wind Waker. Either of these schemes work for my idea. I personally like the second idea better as it offers a fresh new scene for an MMO. This idea offers more sectioned areas for higher level monsters, making it easy to zone areas for higher level players. The first idea would require a more complicated way of making areas higher levels and making them "zoned" despite the persistent world. The first one would work, but for now let's assume use of the second idea, even though both would work just as well. Most of the important features are detailed in the later posts regarding game play and will have some relevance in regard to which of the two ideas is used. The very first players to load into a server would start with nearly nothing to their name. The first players to start on a server would be stationed in an open field with purchase-able land and one lonely NPC: The Servant of Zoan, who will explain the game to you and give you some basic starting items and tools for you to begin your journey across the land. You will be able to sell items to the servant for a very cheap prices, bringing in a source of gold to the game. At a certain level, you will be able to purchase land from the servant if there is any land left in the area to be bought. (Note: Land purchases will be capped and player ownership will be detailed in Post 3) From here the player will go out and begin forging their world. The graphical theme for the game would not shoot to be realistic. Players would be human looking, but the game should focus on being colorful and aesthetic, rather than realistic. I am of the strong opinion that a realistic game does not mean a good game. Most of us play games to escape to a fantastical world, and it does not necessarily have to look real. Take World of Warcraft for example. I think that the game did a wonderful job of creating a world with enough realism to draw you in, but enough color and cartoon like characters to keep you drawn into the fantasy. They sell the idea, but through story and game play, not through crazy amazing graphics. Some games do well with beautiful, precise graphics, I do not think most MMOs need to follow this type of graphical theme. Plus, with simpler more colorful graphics, you save a lot on high budgets and long development times on the art and modeling side. Also lower poly counts means easier rendering for those with lesser powered computers. That's all for this post. The next post will begin talking about leveling up and skills and the type of skills I would like to see and how they apply to the game. After that I'll talk about crafting, questing and player owned property which finishes up the big portions of the game design. I'll work on the next few posts over the next couple days and try to update the blog. As it stands now, MMOs try to conform to a set standard for gaming, and I am of the opinion that this standard needs to be broken. The company that does so, and does it well, will be the next big thing.